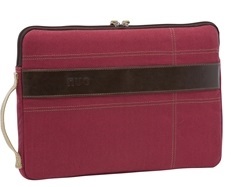 This Eco-friendly Canvas Sleeve-13-in by Nuo features 360 degree laptop protection and anti-scratch cotton interior. With great urban looks and a slim design this sleeve is perfect whether you are traveling for work, school or play. Fits your MacBook 13-in like a glove and most Ultrabook 13-14 inch screens. Includes a large rear zipper pocket for your AC adapter, smartphone and personal accessories. Includes a side carry handle and can be used alone or inside a larger pack or tote. Safe 100% PVC-free and uses water-based dyed canvas.